There are dozens of reasons that you should be building your own website if you’re an Etsy Seller. A website of your own lets you decide who to market to, how to price your work, and how to present your brand. It also protects your business in case anything ever happens to Etsy or to your shop. But there are some myths that Etsy sellers hear about websites that keep them from taking this important step in growing their businesses. Read on for five of the most common ones—and why they’re nothing to be afraid of. This is actually two myths in one: the first is that building your own website means that you have to pay someone a lot of money to design and build it for you. In reality, WordPress + WooCommerce, the software the powers the most versatile online store platform, is free and open source. That means that you pay nothing to use it and it will never go out of business or shut down as long as people are using it. And there are thousands of free or inexpensive website themes out there that are easy to customize with your business’ brand and visual identity. The second myth is that websites are expensive to operate. A business with 150 listings that sells 100 items per month at $25 each would pay almost twice as much in fees on Etsy vs. their own WooCommerce website. It’s true that Etsy is cheaper to get started on since there’s no base monthly fee. But once you start selling, the fees—for listing, for selling, for promoting featured listings—start to add up. In contrast you can get yourself top-notch web hosting capable of supporting a mid-sized online store for less than $20 a month. That and your credit card processing fees are all that you have to pay. According to my eCommerce Fee Calculator, a business with 150 listings selling an average of 100 items per month at an average price of $25 per item would pay almost twice as much in fees on Etsy vs. their own WooCommerce website. And the more sales you make, the more you save. On Etsy, you just worry about your own shop. Their army of software developers and systems administrators keep everything else running behind the scenes. But with your own site, it’s all on you—or so the myth goes. When you run your own site, it’s physically on a computer maintained by your hosting company. And if you get managed hosting, they’ll take care of maintaining and upgrading the software that your site runs on, too. So in reality, you just have to worry about your own website. And the day-to-day work involved—marketing, managing stock, updating products, fulfilling orders, responding to customer questions—is pretty much the same as it was on Etsy. When your business has its own website, you own everything on that site. If your hosting company isn’t cutting it any more, you can find a new one and have them move your whole site over. You keep all your data, all your SEO mojo, your domain name, and all your settings. On the other hand, building your own website using a proprietary service like Etsy, Shopify, Wix, or Squarespace means that you own your product data but that service owns everything else. If you want (or need) to move to another service it’s all on you to recreate your listings, rebuild your SEO, and get your customers to follow you to a new service. You’ll also be subscribed to my weekly newsletter that’s dedicated to helping artists, makers, and small businesses who sell online operate, market, and grow their businesses. You take on a lot of responsibility when you take payments online. And every time you hear about a hack targeting companies like Home Depot or Target it’s a reminder that there’s money to be made in stealing credit card details. When by building your own website using WooCommerce, you have access to the same high-security payment processors as companies like Etsy or Shopify. You can use Stripe to accept any credit card, or PayPal for people who prefer that. Either way their systems are secure and PCI-compliant, and your customers’ credit card info never touches your website. And protecting your site with an SSL certificate has never been easier or less expensive, thanks to services like LetsEncrypt that offer certificates for free. Finally, some web hosting companies like SiteGround are now offering hosting plans that are PCI compliant themselves, which means that you have access to the same level of security as the big guys. One thing that makes Etsy attractive to people just starting out is that you get an instant source of traffic to your store. But are the people that Etsy sends your way the right customers for you? The people who visit Etsy are just a tiny slice of the potential customer base you could reach on the internet as a whole. And you have to compete with thousands of other sellers for a piece of that small slice. Building your own website protects you from the “I got it from Etsy” syndrome. Building your own website takes away all the limits to who you can market to, and how you can communicate with them. You can build an email list, promote your work on social media, start a podcast or YouTube channel—the sky is the limit. And you can target your marketing to exactly the right people so that you can sell your work at sustainable prices. 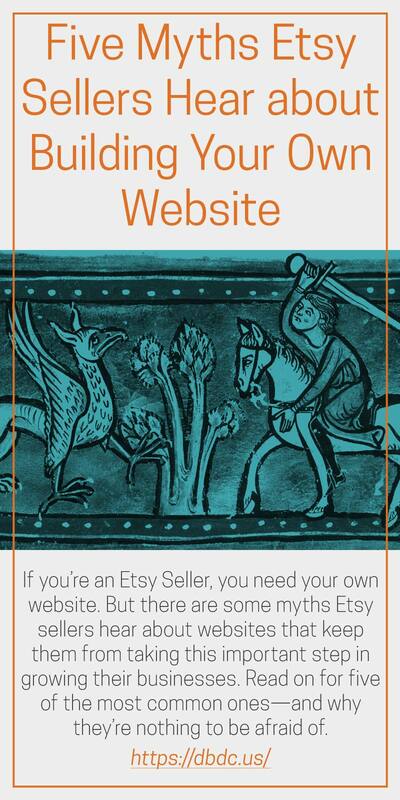 Building your own website also protects you from the “I got it from Etsy” syndrome. Etsy doesn’t make it easy for you to differentiate your business from the others there and encourages buyers to cross shop based on price. So most customers don’t remember the name of the shop they got a particular product—when people ask them where they got their new purchase they always give the same answer: “Oh, I got it from Etsy”. When people buy from your own website, they’ll be able to tell all their friends that they bought that amazing thing from you! Inventory can be a huge concern, especially if you sell one-of-a-kind items. The last thing you want to do is have to tell a customer you can’t fulfill their order because someone else already bought the item. There are technical answers to the inventory question, and also business answers. As for technical answers, there are multiple WooCommerce plugins or stand-alone services that will let you sync inventory counts and product listings between Etsy and WooCommerce. On the more affordable end there’s the WooCommerce Etsy Importer Plugin, that lets you do manual syncs. If you want an automated solution, you can spend a little more on Etsy360 which displays your Etsy listings on your website. It does still use Etsy for checkout, which means that even though you have your own site you’re still bound by Etsy’s rules, which keeps me from recommending Etsy360 whole-heartedly. Finally, at the top of the feature (and price) ladder are services like Stitch that are designed to manage inventory across multiple selling channels, from Etsy to WooCommerce to POS systems for physical stores. Simply sell different things on Etsy than on your website. Having your own website lets you market to customers that you don’t see on Etsy, ones who are willing to spend more or are looking for custom orders. As I said above, having your own website lets you market to customers that you don’t see on Etsy, ones who are willing to spend more or are looking for custom orders. An approach that I have seen work is to use your Etsy store for your less expensive, entry-level products that are priced in line with Etsy buyers’ expectations. Then you can use your website to sell higher-end products and use marketing tools like social media to encourage your Etsy customers, who already have experienced the quality of your work, to go to your website for more options. A website lets you control your business’s brand. It lets you decide how to market to and communicate with your customers. It puts you in control of the experience your customers have when they buy from you, and the experience you have running your own business. It lets you declare your independence from other companies that control the core elements of your business. And it lets you stop renting a table at Etsy’s infinite craft fair, and start owning a digital storefront that is yours and yours alone. Websites aren’t hard, expensive, insecure—they’re essential. Links to WooCommerce and SiteGround are affiliate links.